We headed towards the Grand Canyon today, by way of Monument Valley, but little did we know of the vicious hills around Mexican Hat, out there, waiting to give the bus a serious thrashing. We were also going through a kind of time/space warp into the Navajo Nation where you eventually sense the shift in laws, manners and attitudes of the Navajo people. This shift becomes apparent more quickly when you interact with the Navajo, say, for example, by looking for a Diesel mechanic. It helps to have a good conversation starter too, like giant tie-dyed school bus, perhaps because it brings you a little closer to the artistic sense of the Navajo, compared to driving a big white, loathing beast of a motor home, that represents much of the blander side of white America out here. After a morning spree of last minute souvenir shopping--we needed a good Moab refrigerator magnet for our growing collection that lived above the drivers seat--we rambled out of town into the midday heat, creeping towards the triple digits. Along the road into Mexican Hat, we discovered what appeared to be an Andy Goldsworthy inspired rock formation that gave the town it's name. As we pondered the question of how nature built these things, without cranes or helicopters, the town went by in an eye blink, unnoticed amongst the sagebrush, and we were once again climbing, shifting gears and axles, the bus not at all happy with any selection until I finally jammed it into 2nd. Top speed in 2nd gear is about 25 mph, so slowly up we groaned, with no options other than parking in the middle of the road or driving off into the desert, where the bus would probably not go 10 yards before it got in axle-deep and became a more permanent part of the roadside, if it didn't roll down the embankment to join the tumbleweeds that were stuck there, unhappy and unable to freely ramble about. With no where to go but up, we drove the struggling bus to it's very limits, up 3 steep grades in succession, including some at 10% for maybe 2 or 3 miles. 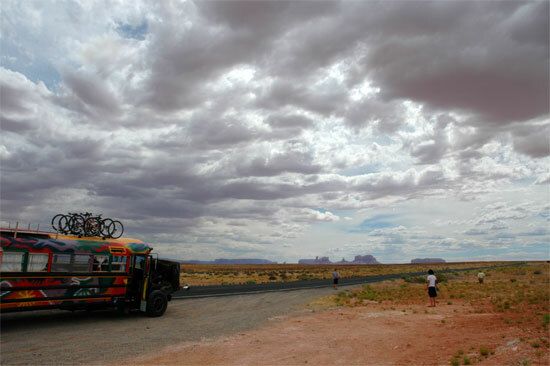 By now the bus was seriously over heating, with the temperature gauge pegged and started blowing clouds of white smoke, typical of a blown head gasket, which suddenly turned to scary black smoke as we crawled over the top and the grand vista of Monument Valley appeared before us. We finally found a place to pull over and the bus promptly died. Somehow, it seemed an inevitable part of a long journey in an old bus. Broken down in a vast picturesque desert, no sign of civilization for miles, we sat in the bus and cooked in the blazing midday heat. Buzzards would surely appear overhead anytime now. The parents worried, wondering if it was possible to get AAA out here any time soon, if at all. The kids got their mitts and ball out and took advantage of the vast sandlot to play catch... no worries. The bus needed to sit and cool, so nothing to do but have lunch, contemplate the situation some more and wonder whether we should drink water or wine. We had lots of water, which was fortunate, since the cooling system needed more than 5 gallons of it and we were sweating constantly, although somewhat imperceptibly in the dry desert heat. An hour later, to our relief, the engine fired right up, although it didn't sound all that healthy and white smoke occasionally puffed from the back as we limped into Monument Valley, where we decided to relax and camp for the night and figure out what to do next. A friendly Navajo guide at the camp suggested that we start talking to the Navajo people in the area and ask around for a mechanic. Lots of them know how to fix cars and trucks, he said, otherwise they would often be stuck out on the desert for days. Oh, great. we love reading every days adventures and can't wait to see how the story ends!! !Did the cool bus make it or not??? ?